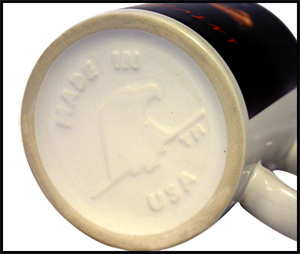 Show your support to American made quality with these USA made mugs. Using our leading edge dye-sublimation print technology, your prints will look just as vibrant and alive many years down the road as they will when they are new. Totally dish washer safe you won’t ever need to be concerned about normal everyday use. USA coffee mugs can be printed with photos, text or your logo, or any combination. Print area on our coffee mugs covers 3.5 inches high by 8 inches wide (from handle to handle). We can custom print our USA made personalized coffee mugs on one side, both sides or all the way around (full wrap). 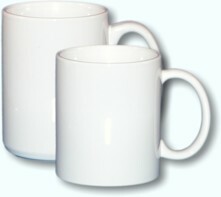 Whether you are looking for a single USA made coffee mug or several USA made mugs, there is only 1 original Elso Mug available only from Elso Graphics and here at 1NHMugs.com. Even volume orders for our USA made mugs can be individually personalized at no extra charge. Do not confuse our custom printed personalized coffee mugs with the traditional quick fade “Photo Mugs” you may see in the shopping malls around the holiday season. Custom printed to order with your image/photo and/or text. No minimums to order. If you are having an event, promotion or other gathering and you know the people's names that will receive a coffee mug, then we offer volume prints with as many lines of variable text as needed at no extra cost. (regardless of the number of personalized coffee mugs ordered).